From Building Ethereum ĐApps by Roberto Infante. 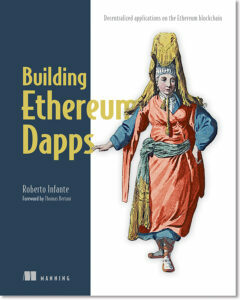 Take 40% off Building Ethereum ĐApps. Just enter code aninfante into the discount code box at checkout at manning.com. Decentralized Applications, or DApps, are blockchain-based applications that are ideal for securing important records, creating smart contracts, preserving ownership claims, and much more. This animation shows you the basic design and behavior of a decentralized voting app built using Ethereum.